Salomon athlete Emelie Forsberg has achieved yet another record. 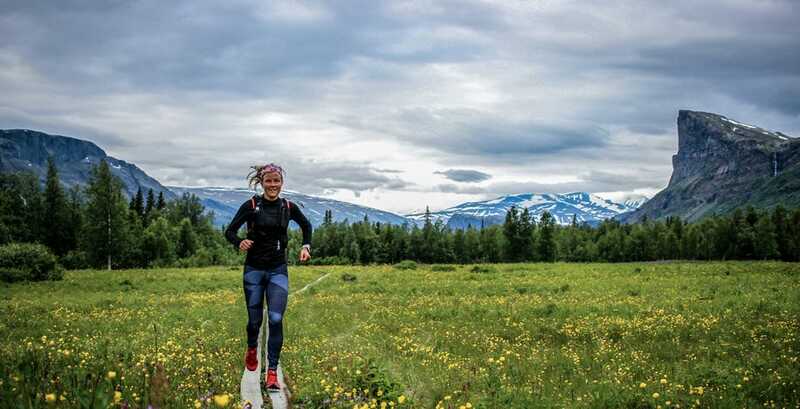 After establishing new speed marks in Monte Rosa and Mont Blanc in late June, she now possesses the Fastest Known Time (FKT) in the Kungsleden Trail in the Swedish Lapland. The Swede completed the 450km trail in 4 days and 21 hours, beating the current FKT, held since 2017 by Norwegian ultra runner Sondre Almdahl, who completed the trail in 6 days, 2 hours and 51 minutes. The Kungsleden (King’s Trail) is a hiking trail in the Swedish Lapland that is usually crossed by hikers in no less than 15 days. The spectacular wilderness of the trail makes it a very popular hiking destination in summer and for cross country in winter. It starts in Abisko in the north and finishes in Hemavan in the South. The highest point is the Tjäktja Pass at 1,150 meters and the lowest at Kvikkjokk (330 meters). Completing the trail is challenging not only for the distance and the terrain but also due to the logistics required. It involves crossing some of the rivers of the Vindelfjällen Nature Reserve, one of the largest protected areas in Europe. For those water parts, there are sometimes scheduled ferries. In other parts, runners must row themselves. Therefore, the arrival times at these points must be adjusted to the boat schedules. The challenge for Forsberg started on July 3rd at midnight in the northern part of the trail, in Abisko. The first stage was the longest, running 116km through the midnight sun until reaching Saltoluokta, the hut where she worked when she was 19 years old and where her love for the mountains began. From there, she ran the 70km of the second stage until Kvikkjokk. Despite the number of kilometers, Forsberg’s legs were feeling fresh and so was her mood. The third stage was probably the wildest, running through a wild track of 96km. “I was running alone today, and it’s so nice the state I got into, just one step at the time, a good pace and to enjoy the beautiful surroundings. I am so lucky,” she said. On the fourth stage, Forsberg started in Jäkkvik feeling very tired. Little-by-little she started to feel better and managed to finish the 97km of this stage in high spirits. It was hard, but the end was near. Finally, on Saturday, July 7th, she ran the last stage of the Kungsleden. Despite having sore legs, the motivation was up to achieve the challenge, and Forsberg completed the stage the entire trail in four days and 21 hours.